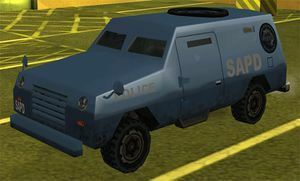 The FBI Truck is an Armored Personnel Carrier (APC) similar to the SWAT Tank intended to be featured in Grand Theft Auto: San Andreas. A rugged police vehicle, the rear-wheel drive FBI Truck handles well on rough terrain and is capable of high speeds considering its weight, making up for its poor steering and braking at high speed due to its weight. The FBI Truck is based on the Cadillac Gage Ranger (as the SWAT Tank is based on the Cadillac Gage Commando V-100). Despite being associated with the FBI, the vehicle still bears the San Andreas Police Department badge on both the backside of the vehicle, as well as on the roof. The FBI Truck is an armored vehicle, it can withstand many major hits before drawing smoke from under the hood. However, it cannot withstand the use of bullets very long before it catches on fire or smoke comes from under the hood. Also, there is also an opening at the top, where a member of the FBI would shoot from. Note that you can't perform a drive-by with this vehicle because the doors dont have windows. As is with the Andromada, it cannot be normally obtained by the player and it is not used by the FBI to chase the player when the player has a wanted level. It can only be obtained through the use of third-party trainers, cheat devices, or modifications. The FBI Truck was meant to appear in the mission The Truth is Out There, but the mission was cut before the game was released, and therefore, the truck does not appear in game anymore. Oddly, the FBI Truck bears SAPD markings instead of FBI markings. This page was last modified on 8 August 2012, at 09:32.